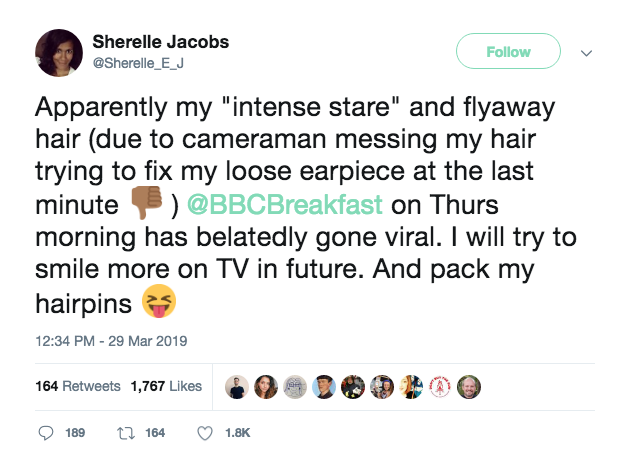 A British TV journalist who fronted a live cross with dishevelled hair and an unhinged stare has become social media’s latest star. This led some viewers to suggest that Jacobs had arrived for the live cross direct from a London nightclub and was possibly even drug affected. “Either that or she’s started the day with 37 espressos,” penned another. Not so, Jacobs later revealed via her Twitter account. And, in fact, it was all due to her professional and steely determination. And Jacobs has received her share of admirers, too. “How many times have we seen male journalists w rumpled hair and stern expressions and we chalk it up to their ‘serious’ work? Why do women have to be perfectly coiffed and smiling, or they get slagged as drunk? You’re handling this gracefully but it’s unfair. Forget the hairpins,” tweeted one fan. “To be fair, I think you represented how we all feel about Brexit at the moment,” said another.